INDIANAPOLIS (January 21, 2014) — Klipsch Group, Inc., owner of the Klipsch, Energy and Jamo audio brands, today announces that company CEO Paul Jacobs has been named a 2014 inductee into the Dealerscope Hall of Fame. With more than 20 years of experience from within the company, Jacobs has worked his way through the ranks and earned a reputation as a trusted and respected leader in the audio industry. With Jacobs at its helm, Klipsch Group has taken significant steps in its product development and marketing efforts. He has helped the company enter numerous new product categories including soundbars, wireless speakers and gaming headsets while continuing advanced innovation on the company’s original core business of loudspeakers. Since forging a partnership with Live Nation Entertainment in 2011, the Klipsch brand has become the name-in-title sponsor of Irving Plaza Powered by Klipsch (New York City), the Klipsch Amphitheater at Bayfront Park (Miami) and the Klipsch Music Center (Noblesville, Ind.) as well as the concert series sponsor at the Cruzan Amphitheatre (West Palm Beach, Fla.) and Verizon Wireless Amphitheater (Irvine, Calif.). To further establish its unwavering commitment to live music, the brand also serves as the title sponsor of the Kings of Leon’s 2014 Mechanical Bull Tour presented by Klipsch Audio which kicks off in February. In addition, Jacobs has executed a large-scale sports marketing initiative that incorporates world-renowned athletes into the daily activities fueling the brand and its overall growth. As a result, current Klipsch brand ambassadors include Andrew Luck (Indianapolis Colts), Robert Mathis (Indianapolis Colts), DeMar DeRozan (Toronto Raptors), Roy Hibbert (Indiana Pacers), Josef Newgarden (IndyCar) and Graham Rahal (IndyCar). In addition to leading the charge during the sale of the company to VOXX International Corporation, Jacobs has helped Klipsch Group experience its most profitable years under his leadership. 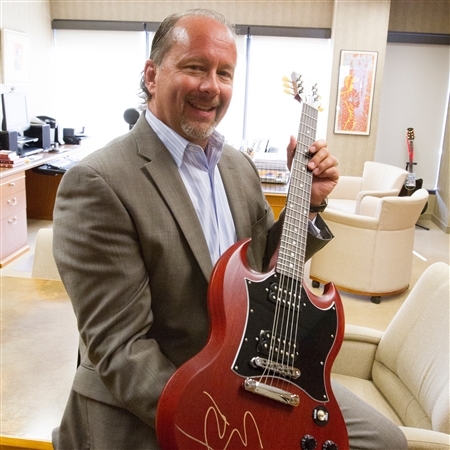 Prior to being named CEO in March 2011 upon the company’s acquisition, he served as president and chief operating officer of Klipsch Group and was responsible for all company operations. In years past, he progressed through several executive level positions at Klipsch, including president of the Klipsch and Jamo brands, executive vice president and chief operating officer, company vice president and vice president of worldwide sales. He first joined Klipsch as a manufacturer’s representative in 1991 after working as sales manager for Lyons & Associates, a consumer electronics rep firm, and as regional sales manager for Fretter Appliance. Altogether, Jacobs’ career represents significant retail, manufacturing, sales and management experience totaling over 30 years. For more information on Klipsch Group’s brands and their relevant product offering, visit Klipsch.com, Energy-Speakers.com and Jamo.com.